Debuting in WWE 2K18 are two new features called MyPLAYER and ROAD TO GLORY. The development team wanted to create a brand new experience for the WWE 2K franchise that emphasized player choice and a focused progression system. With MyPLAYER, we explore several different fighting styles as character classes that feel and play differently from one another. Not only this, but each MyPLAYER is upgradeable and customizable as players make progress. In addition, players can use their MyPLAYERS to progress in both MyCAREER (Single Player) and ROAD TO GLORY (Multiplayer). 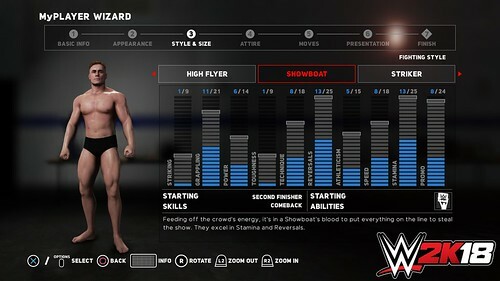 In WWE 2K18, players create their MyPLAYER characters, which they can use for both MyCAREER and ROAD TO GLORY. A MyPLAYER is an upgradable character that gets stronger and more powerful along with the player’s progression in both ROAD TO GLORY and MyCAREER. On the MyPLAYER home screen, there are several customization and upgrade options for your MyPLAYER – in addition to being the portal to MyCAREER and ROAD TO GLORY. We wanted to make it much easier to jump into progression this year, thus the MyPLAYER WIZARD was born. When you first jump into MyPLAYER, you are automatically taken to the MyPLAYER WIZARD to create your MyPLAYER. 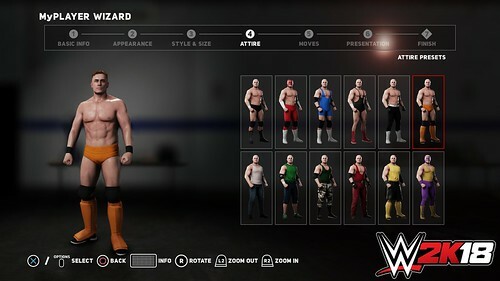 VERY IMPORTANT NOTE: As the amount of creation options is so massive in WWE 2K18, we limited the number of available options in the MyPLAYER WIZARD. Once you finish creating a basic MyPLAYER and leave the MyPLAYER WIZARD, you can always further customize your MyPLAYER in exquisite detail and advanced functionality through EDIT MyPLAYER and UPGRADES. You will find the power of our Creation Suite in Edit Player. Every MyPLAYER has a set Fighting Style (chosen in the MyPLAYER WIZARD). The Fighting Styles are designed to create unique-feeling gameplay experiences. Each Fighting Style has its own strengths and weaknesses in regards to starting attributes, max attributes and available skill and abilities. For example, you should expect a High Flyer to move much faster than a Giant, in addition to performing several aerial maneuvers. Adversely, you should expect a Giant to be much tougher and have more power. Players should choose the Fighting Style that best represents their favorite play styles and interests. Giant – Power and Toughness. Players can upgrade several areas of their MyPLAYERs, including attributes, skills and abilities. All attributes in MyPLAYER this year are grouped into 10 Attribute Towers: Striking, Grappling, Power, Toughness, Technique, Reversals, Athleticism, Speed, Stamina and Promo, with the latter a special attribute that is used just in MyCAREER. 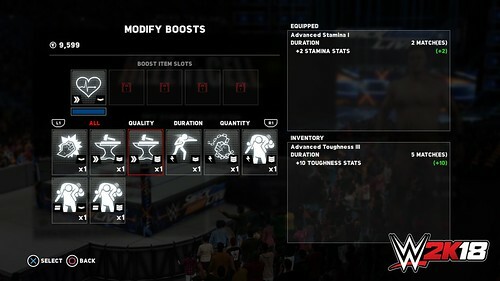 You can view all the sub-attributes for each Tower inside the Attributes screen found in the Upgrades section of the mode. The more attribute points you spend on your MyPLAYERs, the higher their overall ratings will rise. Each new MyPLAYER has a few attribute points available for upgrading their MyPLAYERs right away, but once those are used, more will need to be unlocked through progression in MyCAREER and ROAD TO GLORY. Brawlers start with: Comeback and Remove the Turnbuckle. All other skills and abilities available to each fighting style are available for purchase right away. In addition, not all skills and abilities are usable by all fighting styles. Along with upgrading your MyPLAYER comes deeper customization. This year, you’ll be able to unlock hundreds of moves and Superstar parts to customize your MyPLAYERs as you see fit. Unlocks can be earned through loot cases and progression in both MyCAREER and ROAD TO GLORY. Most Superstar parts and moves are locked from the start. Once an item is unlocked, it is then purchasable with VC. There are three levels of loot cases: Bronze, Silver and Gold. You have a higher chance of unlocking more rare items in Silver and Gold cases. 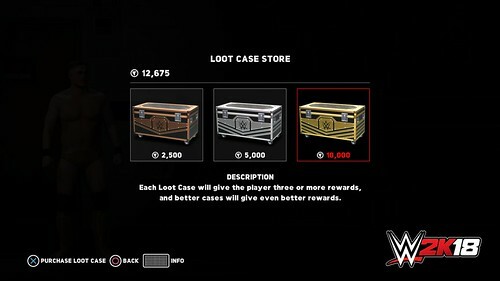 You can purchase loot cases in MyPLAYER, MyCAREER and ROAD TO GLORY. You will also earn loot cases through progression in both MyCAREER and ROAD TO GLORY. BOOSTS – Boosts are used in ROAD TO GLORY. 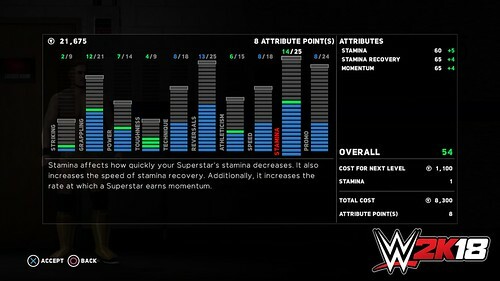 There are also Rare Superstar parts and moves that are unlockable exclusively through MyCAREER and ROAD TO GLORY. ROAD TO GLORY is a completely new online experience where MyPLAYERS from all over the world battle against each other. Players can compete daily in a variety of match types to gain stars, boosts, Superstar parts and VC. In addition, by increasing their levels, they can further customize their MyPLAYERs to gain the advantage over others. 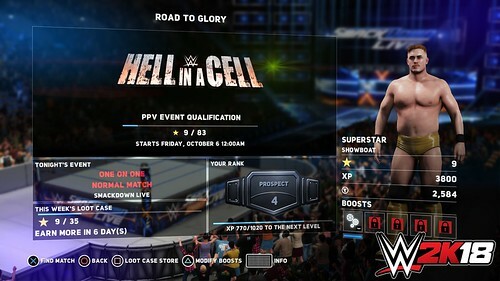 Overall, players are encouraged to see if they have what it takes to secure entry into pay-per-view events and defeat their favorite WWE Superstars to earn special rewards. 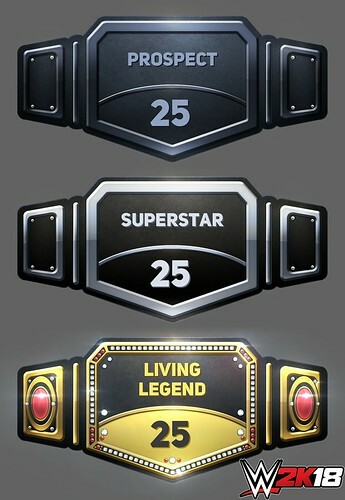 Players can battle head-to-head against other MyPLAYERS to earn stars and qualify for pay-per-view events. They simply start matchmaking by pressing FIND MATCH when they get to the ROAD TO GLORY main screen, and the game will find you a worthy opponent. TONIGHT’S EVENT is the daily match event that cycles every 24 hours and features a different match type. You might see a ladder match one day and a steel cage match on another. TONIGHT’S EVENT also cycles through different arenas, like WWE Raw or NXT, as well as classic venues like WCW Monday Nitro. Players are encouraged to check back every day and see what is next up for TONIGHT’S EVENT. In ROAD TO GLORY, we are introducing Boosts. 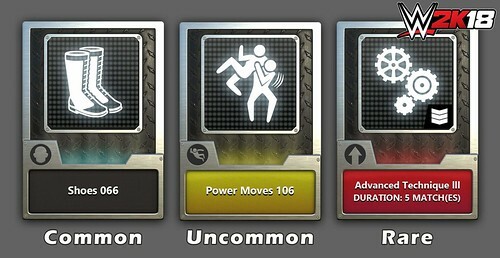 You can equip up to five active Boosts in a single match, and they have a wide range of enhancements for MyPLAYERs. 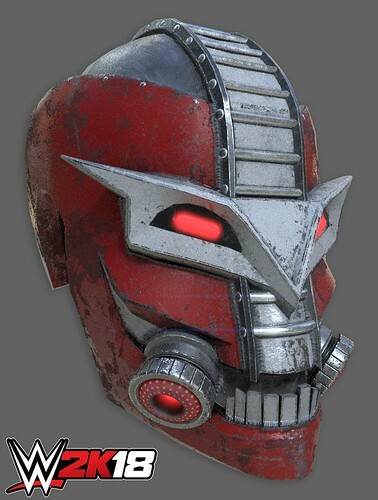 Some BOOSTS will increase specific stats in areas like striking, speed, grappling. Also, there are other types of boosts that reward additional XP at the end of a match. All MyPLAYERs start with one Boost Slot unlocked; you can then unlock four additional Boost Slots through player progression. Leveling up within a rank earns you loot cases, attribute points and additional boost slots. In addition, when you see a Hall of Famer, you know that player has put a ton of time into the game. 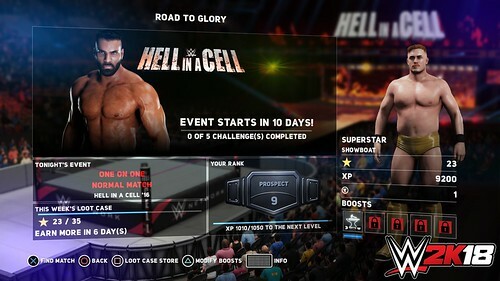 One of the most exciting features of ROAD TO GLORY is that the mode parallels the real-world WWE pay-per-view schedule. 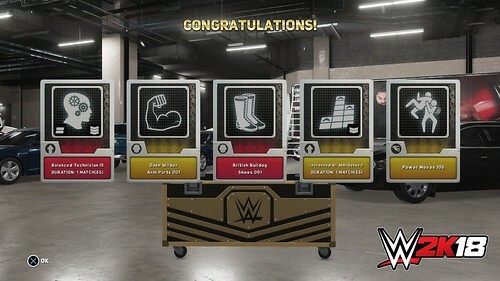 When a pay-per-view happens in real life, that pay-per-view will also be featured as an Event in ROAD TO GLORY. You can participate in any upcoming PPV Event for which you qualify: Earn the required amount of stars in time to qualify for a PPV Event. However, if you are short on either time or stars, we let you purchase your way into Events. While in a PPV Event, all matches will take place in the event’s special venue. Once you qualify, you will complete challenges to get into the Main Event. In addition, since we know everyone wants to watch the real-life pay-per-views, our PPV Events run across multiple days, so you have the chance to prove yourself worthy of a shot in a Main Event. The Main Event is essentially the highpoint of the PPV Event. 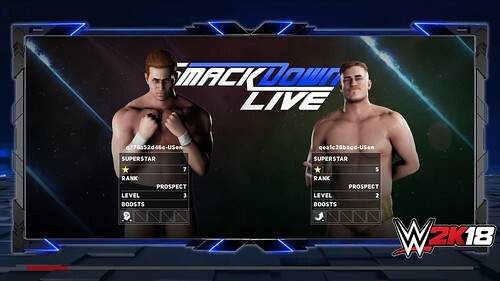 In the Main Event, you compete against WWE Superstars who are featured in the real-world pay-per-view. 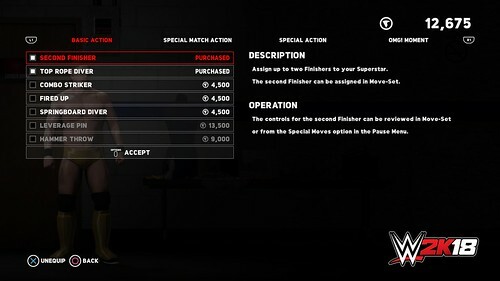 To qualify for a Main Event, you need to complete a required amount of match Challenges. 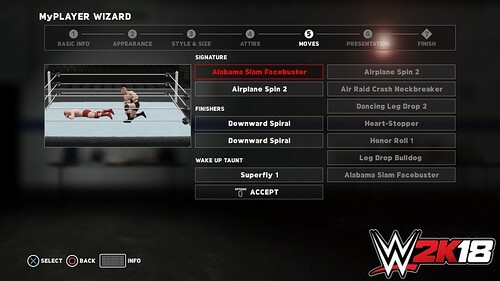 Examples of match Challenges could include items like performing three signature moves to putting an opponent through the announce table. We are excited to watch everyone take a MyPLAYER on a unique ROAD TO GLORY. Last edited by cdj; 10-03-2017 at 03:06 PM.